The Omega 12 is a 12 watt rms ceiling Speaker with a smooth frequency response for quality sound reproduction. It is ideal for offices, factories and other rooms with suspended ceilings. The speakers steel, slim-profile grille is finished in matt white. The Omega 12 can be used on 100 volt line Public Address systems and has power tappings down to 3 watt. It comes with a first-fix support bridge to make installation simple and easy. 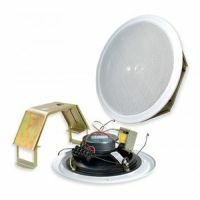 12 watt rms, 100 volt line ceiling Speaker. Steel, slim-profile grille finished in matt white. 12 watt, 9 watt, 6 watt and 3 watt power tappings. 165mm driver for quality sound reproduction. First-fix support bridge for simple installation.